Editorial Note: Since September 2017, the Fourth Estate investigative team has been gathering information on the relationship between GMU and billionaire donor Charles Koch. The following story is the first part in a series of three in which we will release everything we have learned in that time. Koch, who received an honorary doctorate from Mason in 2002, has since tried to live up to this philosophy, donating to hundreds of schools in the past several decades. 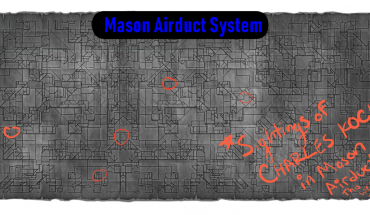 However, none of his donations come near the amount given to Mason. Charles Koch is the chairman and CEO of Koch Industries, a multinational conglomerate he and his brother, David Koch, inherited from their father. While the company began in oil refinement, it has since branched out into other fossil fuels, including jet fuel and diesel, as well as everyday construction materials, textiles, agriculture, medical technology, and infrastructure, according to the company’s website. The nonprofit website opensecrets.org lists Koch Industries as one of the largest donors to the Republican party in the country, giving generously to both campaigns and politically conservative organizations every year, including the National Republican Senatorial Committee and notable Republicans such as Rep. Paul Ryan (R-WI) and Sen. Roy Blunt (R-MO). According to Koch’s public tax records, the energy tycoon has donated approximately $95.5 million to Mason since 2005 through the Charles Koch Foundation, his charity organization. Most recently, Koch and a second anonymous donor signed grant agreements in 2016 to give $20 million to Mason over a five-year period to fund the Antonin Scalia Law School. Fourth Estate’s investigative team has found that these donations do not come without strings attached. 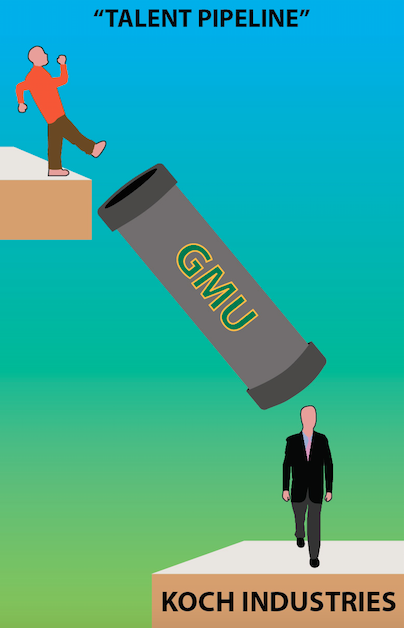 “At George Mason University, academic research predominantly underwritten by Koch has resulted in professors lobbying on topics related to Koch’s financial interests, including energy issues and state ­level politics,” according to “Koch Oversteps of Academic Freedom,” a joint report created by Unkoch My Campus, a national campaign dedicated to removing Koch influence from universities, and the Florida State University Progress Coalition. One of the lobbyist professors listed in “Koch Brothers’ Higher-Ed Investments Advance Political Goals,” a Center for Public Integrity Article cited by the Unkoch My Campus report, is economics professor Walter Williams. Williams was selected by the 60 Plus Association, a nonprofit funded in part by Koch, to be a member of its “truth squad,” and lobby against Social Security and Medicare expansions. The Center for Public Integrity is a “nonpartisan, nonprofit investigative news organization,” according to their website. The Charles Koch Foundation has made it clear in the past that their goal is not to fund and support public higher education for its own importance, but for their own private interests. The Mercatus Center and the Institute for Humane Studies at Mason are two examples of how the Charles Koch Foundation is facilitating a “talent pipeline,” a term coined by the Charles Koch Foundation to describe a cultivation of student talents in universities across the country. According to Stowers, the network of scholars involved in this talent pipeline serves as the “backbone” of their higher education investment. Stowers claimed at a Koch donor summit in 2014 that the educational goals of the Charles Koch Foundation are to have their talent pipeline “become the major staffing” at Koch-funded think tanks and political organizations. “The new talent pipeline is critical to advance what we need in order to be successful,” said Stowers. This talent pipeline has branches in more than 20 university-based research centers and more than 400 on-campus undergraduate programs. 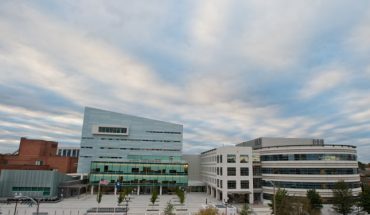 Of those, more than 20 university-based research centers, the Mercatus Center at Mason is the “largest collection of free market faculty that exists anywhere at any university anywhere in the world,” according to Stowers. In other words, Koch involvement and expansion in higher education is more evident at Mason than any other university. What is the Talent Pipeline? The idea of the talent pipeline relates back to Mercatus Center founder Dr. Richard Fink’s “The Structure of Social Change,” a policy adopted by the Charles Koch Foundation during Fink’s time as president of the foundation. The model is described as an “integrated strategy” of formulating social change through scholars who are a part of think tanks and research centers. A longtime associate of Charles Koch and former executive vice president of Koch Industries, Fink devised the idea based on a model put forth by economist F.A. Hayek. Fink’s use of the term “social change” refers to the impact students can have on public policy. The model begins with the “investment of raw materials,” or “exploration and production of abstract concepts and theories.” This refers directly to scholars involved in higher education, and the materials they are exposed to during the idea-making process. However, according to Fink, ideas and theories are useless without a way to apply them to society. This is where think tanks and policy institutions like the Mercatus Center come into play. “Without these organizations, theory or abstract thought would have less value and less impact on our society,” Fink wrote. Students who are exposed to the initial ideas now apply them within these institutions — in this case making the ideas of a free-market economy a reality within the organization. Finally, the policy ideas formulated within these think tanks must be implemented into proposals to enact particular change within a society, which is the ultimate goal of the strategy. The three stages of this model are the logic behind a talent pipeline that ultimately drives forward the free market libertarian ideology supported by Koch. The Mercatus Center, originally called the Center for Market Processes, was created by Fink in 1977 while he was a graduate student at Rutgers University. Fink’s center focused on the study of free market economic theory. In order to grow his center, Fink applied for a donation from the Charles Koch Foundation. According to “Dark Money,” a book about the Koch network written by New Yorker journalist Jane Mayer, the Koch foundation granted Fink a donation of $150,000 to continue his research. While Fink was attempting to build his institute, other faculty members at Rutgers became increasingly concerned with the idea of a donor-funded and Koch-controlled center at the university. “The fact that we’d established this relationship in some way might have injured us with faculty members,” said Rutgers Economic Chair John Cullity in an interview from 1991 entitled “Preserving Memory: Newark and Rutgers in the 1960s and 1970s,” describing Fink’s departure from the university. Fink was forced to move the center from Rutgers to Mason in 1980. 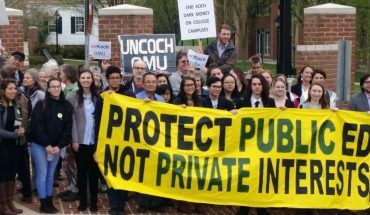 “Faculty dissent is why [Mercatus] is even at [Mason] — because Rutgers kicked it out,” said Ralph Wilson, head researcher of Unkoch My Campus, in an interview with Fourth Estate. Mercatus’ student programs, focused on the application of free market economics, would likely benefit the interests of international businessmen such as Koch. The Hayek program’s curriculum is based on an interdisciplinary approach to economic learning. It combines various disciplines from the social sciences and humanities to an education grounded in economics. “[Mercatus tries] to train students to be excellent communicators of economic ideas to their peers in the scientific discipline, to their students in the classroom, and to those interested in economics discussions in the general public,” explained Dr. Peter Boettke, the current director of the Hayek program and vice president for advanced research at Mercatus. Mercatus alumni “disproportionately go into the nonprofit sector working for NGOs [non-governmental organizations] or working in public policy,” explained Executive Director Daniel Rothschild. They are also “disproportionately represented in the bipartisan committees on the hill” such as the joint economic committee or the joint committee on taxation. Mercatus staff are responsible for overseeing student programs or performing research of their own under the guidelines of the center. This research has been featured in current policy developments like the recent Republican tax plan. While a decent portion of Mercatus alumni leave the institute to teach at other universities, or to work at NGOs or policy committees in D.C., a large portion of Mercatus alumni go on to be employed by the center. “Mason alums, of which I am one, are highly represented on the Mercatus staff,” said General Director Tyler Cowen. IHS has many programs, seminars and methods created to educate and train students in the same type of free market economic ideology promoted by the Charles Koch Foundation, even using the same language to describe themselves. Some examples of this talent cultivation within IHS can be found in Mayer’s “Dark Money.” Mayer alleges that Charles Koch ordered for “ideology tests” to be done on students at the end of each week to gauge students’ political leanings after seminars at the institute. When asked about these ideology tests, Dr. Chamlee-Wright stated that students are supposed to take anonymous surveys at the beginning and end of each week-long seminar. She stated the reason for these surveys is to ensure that no students would be “wasting their time” in the seminars. The exact content of the surveys is unclear. Another example Mayer cites is the process of scanning students’ applications through a computer to count how many times key figures in libertarian politics are cited in their application essays. When asked about the application process mentioned in Mayer’s book, Dr. Chamlee-Wright stated that she has no knowledge of this process within the institute. Several programs offered through IHS are offered only to faculty to develop policy writing skills. One of these programs is the institute’s Policy Research Seminar. Dr. Chamlee-Wright stated that while some graduate students can be invited to these seminars, it is primarily for faculty, indicating that the talent pipeline is not exclusive to students. When asked how this program benefits the student body at Mason, Dr. Chamlee-Wright stated she had no knowledge of any such group, even though it is advertised through her own institute’s website. An article published by The Atlantic, titled “Spreading the Free-Market Gospel,” states that skeptics such as the Center for Public Integrity believe that “the Koch brothers’ college-focused money, by helping advance a philosophy of economic liberty, is eroding a fundamental aspect of higher education: academic freedom.” This opinion is based on audio recordings the center obtained from a 2015 Koch networking summit. In part two of this story, the Fourth Estate investigative team will describe how the Mason administration helps facilitate Koch’s talent pipeline.